Pitá Arquitetura created the design for CUBO, a new startup incubator office located in Sao Paulo, Brazil. CUBO is a Startup Incubator, located in the same neighborhood, Vila Olímpia, a place famous as being home for international companies offices and young people eager to change the world. Their new home is four times bigger than it’s last space and invites more than 1000 people working there daily. The ground floor is open to the street, so everyone who walks through it, take a look at what’s going on, take a sit and relax, talk, and even have a break at a coffee shop. 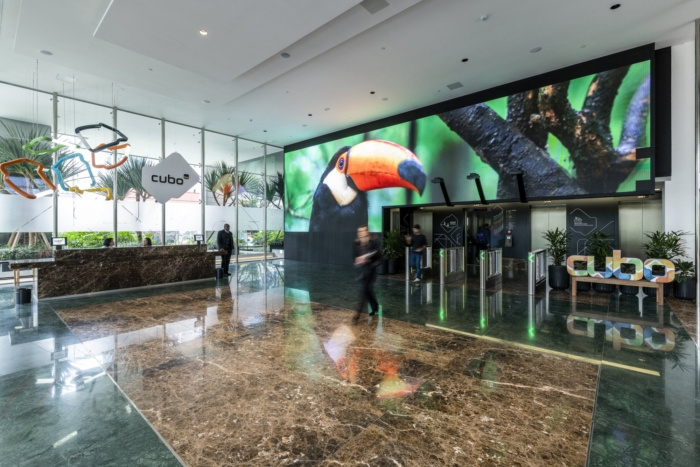 There is a massive video wall, which creates a colorful and diverse aspect to the entrance, welcoming the visitors. The exterior walls are covered with street art, reflecting the personality of the city. A few floors up, auditorium can hold 380 people, and with the retractable partitions it can be split into 2, so it is possible to hold two simultaneously. All the spaces have been designed to be as versatile as possible, different sizes of conference rooms for the most diverse purposes and training rooms that, like the auditorium, can be divided into two, or together become a huge space. 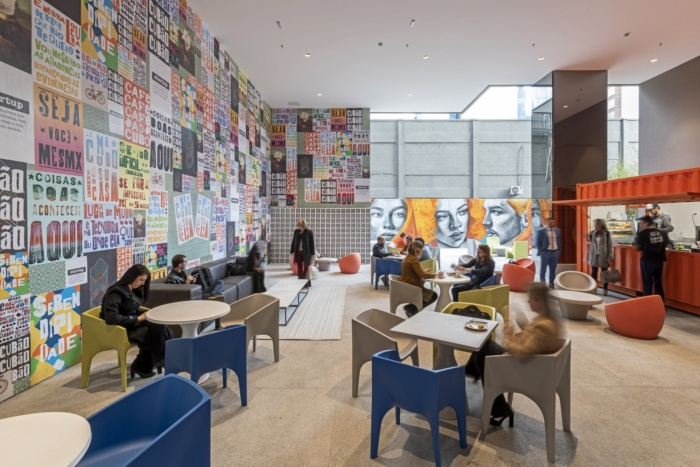 At the rooftop, a vibrant mood goes along with the space, with areas for food, free beer for the employees, games, and a “beach” at the outside area, with sun loungers, beach umbrellas, and a colorful floor design, with colors and shapes inspired by the notorious landscaper Burle Marx.